Shirts With Random Triangles: South Carolina Adds JUCO Linebacker To Its 2017 Recruiting Class. South Carolina Adds JUCO Linebacker To Its 2017 Recruiting Class. Eldridge Thompson. Image via espn.com. South Carolina has its second 2017 recruiting class commitment of the day. 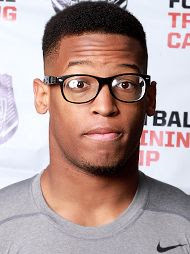 Memphis, Tennessee JUCO linebacker Eldridge Thompson committed to the Gamecocks on Saturday. The news of Thompson's commitment came shortly after 2017 wide receiver/athlete prospect Shi Smith announced his commitment to South Carolina. Thompson attends Coffeyville Community College in Coffeyville, Kansas. He attended White Station High School in Memphis, Tennessee. He stands 6'2, and weighs 218 lbs.